"This is a great opportunity for all residents to learn of the grants available when they are having trouble paying their bills" said Mayfield. "I encourage everyone to come by and take advantage of the resources we will be providing." 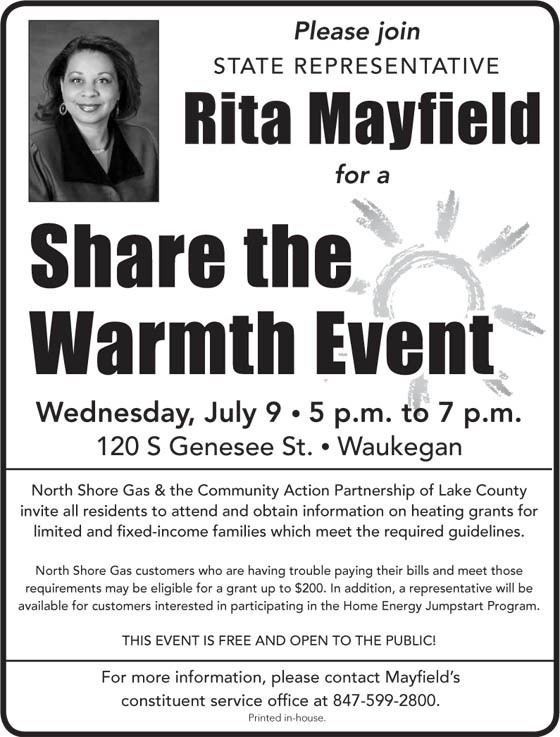 North Shore Gas & the Community Action Partnership of Lake County invite all residents to attend and obtain information on heating grants for limited and fixed-income households which meet the required guidelines. North Shore Gas customers who are having trouble paying their bills and meet those guidelines may be eligible for a grant of up to $200. In addition, a representative will be available for customers interested in participating in the Home Energy Jumpstart Program. The event is free and open to the public.